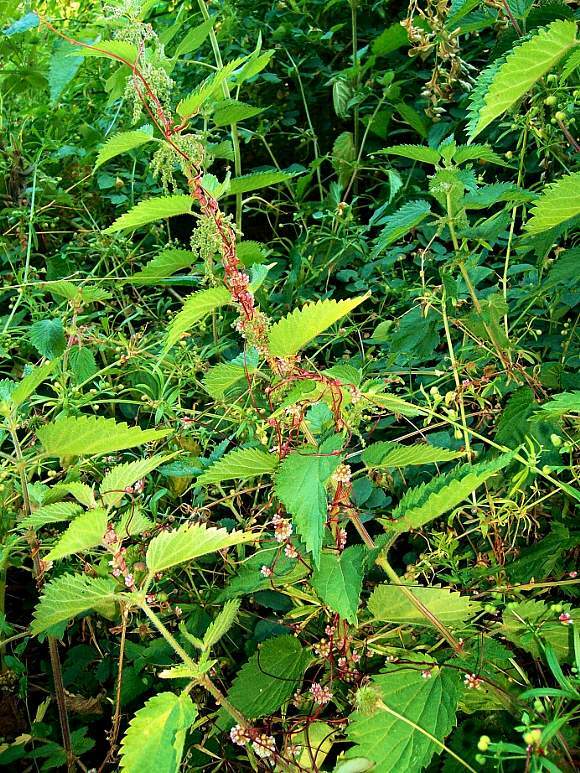 Parasitizing Stinging Nettle, it's favourite. Has red stems, but you cannot rely on this feature for identification because Dodder also has red stems. And you can't anyway: sometimes the stems are green or yellow-green, as here. Parasitizing Stinging Nettle. The lime-green colour of this nettle is probably because the photograph was flash-illuminated? No Dodder kills the plants it is parasitic upon, it just taps some of the nutrients. the red flowers are opening and turning paler. Dodders even entwine around themselves. It looks like Dodder spirals around plants in am clockwise direction as it grows longer. The flowers are at intervals along the stem and in small globular clusters, unlike those in the night sky which are really rather big! The sepals are red with 4 to 5 teeth. The petals might be pale-green below. There are two styles within plus 4 or 5 anthers. Greater Dodder feeds parasitically primarily on Stinging Nettle (Urtica dioica). It likes to be near water, is decreasing in occurrence and is found locally in England south of Peterborough. It is not common and really quite rare. Dodder detects the presence of certain desirable host plants by the volatile organic compounds that the host produces, and is able to home in on the host plant, wrap its tendrils around it and tap into it if it deems the host beneficial. But the host plants are not defenceless in this attack, and often synthesize deterrent and toxic molecules (phytoalexins) in response. Dodder does possess leaves, but they are minute and scale-like, and, lacking chlorophyll, not green. Dodder is thus holoparasitic , unable to photosynthesize it must parasitize to obtain all its needs. Somewhat surprisingly, some parasitic plants are able to parasitize themselves, a phenomenon called self-parasitization. Species of Dodder are one such, Mistletoe too in some instances.